Why build access control with RFID project? RFID (Radio Frequency Identification) is one of the most popular technologies used for identification purposes. The RFID cards are used along with RFID readers to capture information on the card and then take an action - open gate, mark attendance, charge money etc. 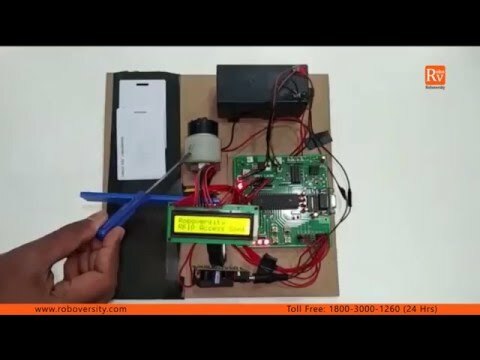 This project helps you learn and build one such project using RFID is a hands-on manner. In this project you will build a RFID based Authentication system which can open and close a gate by detecting the matching RFID tag. You will practically work with RFID devices, RFID readers and program tbe system to make it work. Module 1: What is Access Control System? Learn: How do RFID Systems work? How can you build this access control with RFID project? How to build a access control with RFID project? Login to our online learning portal will be provided instantly upon enrollment. The portal will have video lectures, tutorials, and quizzes required to build the access control with RFID project. Kits are well tested and shipped to your doorstep in 24 Hours. Use the kit along with the online portal to complete the project at your home itself. How much time do I have to complete the access control with RFID project? What will be in the access control with RFID project kit that I will receive? RFID Tag - 2 Nos.